OK4Youth serves foster and other at risk children. The following are some of the activities and support services offered. Project Plus (boys 15-18) and area foster teens are supported by the Georgia Department of Family and Children Services. Youth from these groups meet the first Thursday of each month with their mentors for life skills programs. The program begins with dinner that promotes a comfortable atmosphere, conversation and open discussion, followed with life skills training that incorporates communication, listening and interaction. Mentors take part in the program and encourage teen participation. A guest speaker – a business owner, a corporate executive, or a member of one of our organizations – further engages with the youth to plant the seeds of possibility and relay the message that every success requires discipline. Each mentor is accessible to their mentee for support, homework help, and as someone to talk with. Fieldtrips are scheduled each quarter. A 2008 fieldtrip included a visit to IKEA-Atlanta and WSB TV. The General Manager of IKEA spoke with the youth about their corporate training program for new employees and the necessity of education. The teens visited WSB TV where the station’s general manager, Bill Hoffman, and news anchor, John Pruitt, both spoke to the youth concerning education, setting personal goals, and following their dreams. The day ended by watching a live newscast in the studio. In turn, our youth give to their community. Their service project in 2008 was part of National Youth Service Day and involved refurbishing and laying new sod for the Marietta Youth Athletic Association athletic field. M.Y.A.A. is a nonprofit corporation. 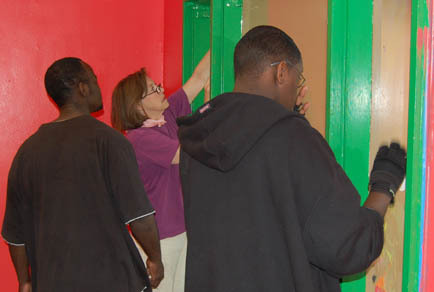 In 2008 our youth helped revitalize Marietta Boys and Girls Club and St. Philips United Methodist Church. Since 2006, we have had the privilege of working with schools (at-risk boys and girls 8th-12th grades) in establishing better standards of accountability for our youth. If they are not viewed seriously within the school environment, our students do not approach their own responsibilities seriously. Through collaborative efforts of our board president, a Department of Family and Children Services coordinator, and the school counselor, steps have been taken to enhance scholastic improvements. Continuing the momentum for scholastic achievement with a system of review remains a primary focus of the program. We additionally have a joint relationship with Kennesaw State University through their interns program. This past year, a Kennesaw State intern and our board president have been working in the respective schools alongside our youth and educators. For more detailed information about our work, please contact us.